FANBOY PLANET.com . 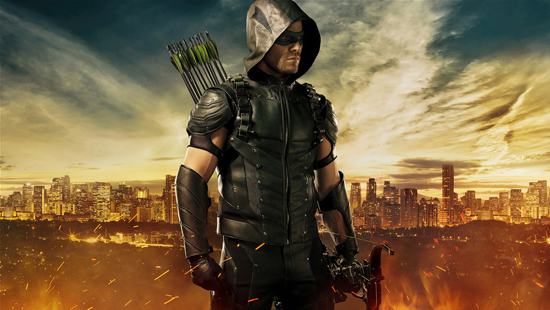 : 2015-comic-con-Arrow-Season-4-costume :. The reveal came tonight in a panel titled "A Night of DC Entertainment," three hours of geeky goodness in Hall H. It featured a full pilot screening of Supergirl -- which is a great pilot -- and panels featuring the stars and producers of Arrow, The Flash, Gotham, and DC's Legends of Tomorrow, plus a sneak peek at the new digital animated series Vixen -- which, by the way, is set in the same universe as the other CW DC shows. During the panel, they gave fans a look at the new suit, created by resident costume designer Maya Mani. She has also designed many of the show's costumes, including Arsenal (Colton Haynes), Black Canary (Katie Cassidy), Speedy (Willa Holland) and Ray Palmer's current incarnation of A.T.O.M. (Brandon Routh). I'll also bet that Mani will have a hand in the White Canary's costume for DC's Legends of Tomorrow, too. It's a bit of a throwback to Oliver's leather, hooded vigilante look from the first season, but in a slightly brighter green -- thanks to Cisco from The Flash. 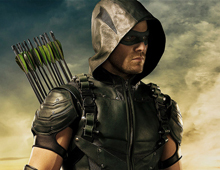 It might not yet be the Green Arrow we think of as a superhero, but that will come. Barry Allen already knows that Oliver will be one of the founders of the Justice League with him. Season Four will debut Wednesday, October 7, at 8/7 central on the CW. In addition to regulars Amell, Cassidy, Holland, David Ramsey, Emily Bett Rickards, John Barrowman, and Paul Blackthorne, Neal McDonough will be making special appearances as Damien Darhk. And for those of us who need a recap, here's the highlight reel of Season Three that Warner showed the crowd tonight.